The highlight of 2018 for Ty Erickson won’t be his fifth Wrangler National Finals Rodeo. It will be marrying the love of his life Cierra Kunesh on October 20th. Then the couple took a few days away from the rodeo arena and had a honeymoon in Jamaica. So, when Ty shows up in Las Vegas in December, he’ll have a ring on his finger and some new tan lines to show off. While Cierra heads up the Team Ty fan club, Ty will be as focused as ever in the arena and hoping for lots of money to help the newlyweds start their lives together. Montana will be hoping for the elusive gold buckle in steer wrestling. In the rodeo arena, this year got off to a slow start for Ty. He wasn’t in the top 20 in the world standings until the middle of May. A win at the Redding (California) Rodeo gave him a much-needed boost. Ty continued picking up checks and when September 30th rolled around, he was fourth in the world standings with $89,662 in regular-season earnings. 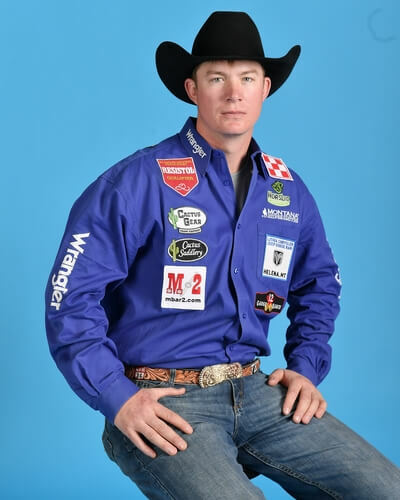 He joined the PRCA in 2011 and squeeked into his first NFR in 15th place in 2014. He finished that year in seventh place. The next year, Ty started in third and finished the year in fourth. He had outstanding regular seasons in 2016 and 2017 and qualified for the NFR in first place both of those years. Las Vegas wasn’t kind to him in 2016. He dropped to seventh in the world standings. In 2017 he was steadily dropping steers until disaster struck in the ninth round. The steer almost got away from him, but his “Do What It Takes,” mantra came into play and he finally got the clock stopped in 26.8 seconds. In the end, he finished as the reserve world champion behind Tyler Pearson by $2,190. Ty has remarked that the best thing you can do in rodeo is have a very short memory. That has kept him looking forward and thinking about the next steer. He has 10 more to think about this year in Las Vegas. With his parents, Sid and Janet, brother Josh and wife, Cierra supporting him, Ty has every reason in the world to keep using his #DoWIT attitude. They are all hoping that this year, his placing in the world standings moves up and he gets to take the Montana Silversmiths Gold Buckle home to Montana.